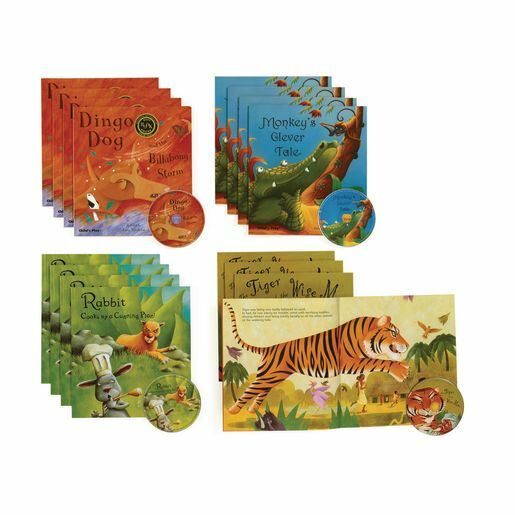 Children will connect spoken words with written words as they follow along with these 4 traditional stories with a twist. Traditional African-Caribbean story about a monkey who hatches a plot to trick a crocodile in to helping her cross a river. Traditional Australian story about animals of the Bush who are fed up with Dingo Dog's bullying ways, so they come up with an idea to teach him a lesson. Traditional North American folk tale about forest animals who are tired of a lion throwing his weight around. Rabbit comes up with two plans that lead to the lion's downfall, proving that brains and not brawn will win in the end. Traditional Indian tale about a wise man who appeals to other animals in the forest to save his life when he is tricked by a mischievous and hungry tiger. The wise man learns that even being saved from a tiger has its dangers. RF.K.1a. Follow words from left to right, top to bottom, and page by page. SL.K.2. Confirm understanding of a text read aloud or information presented orally or through other media by asking and answering questions about key details and requesting clarification if something is not understood. SL.K.4. Describe familiar people, places, things, and events and, with prompting and support, provide additional detail. SL.1.2. Ask and answer questions about key details in a text read aloud or information presented orally or through other media. SL.K.1a. Follow agreed-upon rules for discussions (e.g., listening to others and taking turns speaking about the topics and texts under discussion). SL.K.6. Speak audibly and express thoughts, feelings, and ideas clearly.